Disciples congregations celebrate the Lord’s Supper every Sunday. The table is open. That means that all Christians are invited to respond to Christ’s invitation to draw closer to Him around the communion table. For Disciples, the open table is a powerful symbol of our deep commitment to Christian unity. The open table honors diversity even as it celebrates unity in Christ. All are welcome! 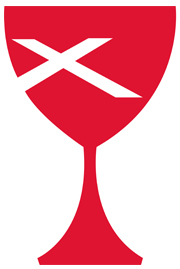 The chalice symbolizes the central place of communion in worship for the First Christian Church (Disciples of Christ). The X-shaped cross of the disciple Andrew is a reminder of the ministry of each person and the importance of evangelism.